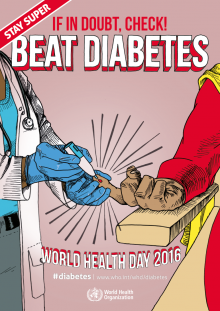 This 7 April is World Health Day, and as has been typical of recent years a thematic focus is adopted and on this occasion is ‘Beat Diabetes‘. The world over is continuing to experience a double burden of disease with chronic conditions such as cancers, diabetes and heart diseases increasingly prevalent while still tackling the challenges associated with epidemics and infectious diseases which are overwhelmingly associated with elevated child and maternal deaths. 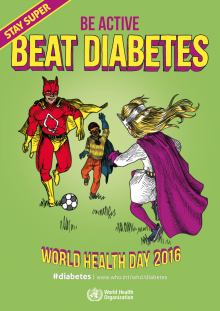 As such, it is fitting that the World Health Organization (WHO) has focused the promotional activity and materials surrounding this annual event towards a non-communicable disease. Their recent findings state that 350 million people worldwide have diabetes, a number likely to more than double in the next 20 years. Meanwhile, in 2012, diabetes was the direct cause of 1.5 millions deaths, with – perhaps surprisingly – more than 80% of those occurring in low and middle-income countries. With reports of diabetes (particularly Type II) amongst children as well as the general population on the increase, it is unsurprising that the event-specific posters produced (some of which are shown below) engage in a discourse of self-care, offering accompanying practical advice. Indeed, the following material advocates being ‘active‘ with the recommendation that at least 30 minutes of regular, moderate-intensity activity on most days helps prevent Type 2 diabetes and its complications, as well as helping people to better manage Type 1 and Type 2 diabetes if they have it. Poster reproduced with permission of WHO. Comparably, the following ‘halt the rise’ poster channels the event’s key messages of: ‘be active’, ‘eat healthy’, ‘follow medical advice’ and ‘if in doubt, check!’ With more and more people getting diabetes around the world, diabetes-specific vertical programmes at both country and international levels are trying to wisely situate the prevention and management of diabetes, and associated non-communicable diseases, within a generalisable advocacy campaign for a healthy lifestyle. What is problematic is the timeworn lexical field of militancy. WHO’s material is studded with imperatives such as ‘beat’, ‘halt’ and ‘check’ all demanding an opposition to be drawn between person and disease. This carries most risk when referring to current diabetic patients, for this dissociation could encourage a self-distancing from care for one’s own body and a false sense of disempowerment over the situation. Indeed, there is a likelihood that the individual will encounter this terminology as suggesting a demolition or lack of agency on their part. With respect to the potential population at risk, this discourse implies a misplaced effort that is destructive rather than constructive and preventative. Not only is this discourse linguistic but also performative as these actions determine the way that we form our understanding of health. Such poorly considered marketing methodologies are not new, particularly those pertaining to health management campaigns. The UK-based charity Cancer Research pins its colours to the motto ‘let’s beat cancer sooner’. More careful consideration must be given to the concept of health and illness, taking into account on what basis people make health decisions, whether the biomedicalization of illness should be resisted, and what makes a sickness or ill health appropriate for management by a doctor with biomedical training as opposed to another kind of health professional. In Illness as Metaphor (1978) Susan Sontag brilliantly assesses metaphors on living and specifically argues against such martial metaphors of cancer and ‘beating’ it. Fields of representation and associated symbols direct our understanding of health in powerful and didactic ways. Frequently someone experiencing ill health is classified as a ‘sufferer’, ‘soldier’ or ‘survivor’, somehow championing a cause tipping into the realm of heroism. Of course, such labels can be helpful to many people, but from experience they are largely employed to guise or redirect fear and impotence, in ways that are only useful to a self-limiting degree. Language shapes the environment that we live in with the normalization of things in the context in which they are worded. For instance, University College London Teaching Fellow in Anthropology and Global Health Dr Rodney Reynolds offers the example of ‘I’m going to hit on her’ or ‘I’m going to pick her up’ – even in a society that increasingly discusses intimate partner violence with frequency and openness, the distinct field of dating indirectly encourages this very activity. While punchy and memorable health messaging might help a diabetic patient manage life without being able to eat an entire box of donuts if they have a stressful day (a perfectly permissible, if unwise, decision for ‘healthy’ individuals), this invitation to fight and beat a disease only tangible in the readings on a glucometer might be less empowering than a simple invitation to ‘be kind’ and considered to one’s body and approach its management with moderation and a personalised understanding that develops over time. Mathers CD, Loncar D. Projections of global mortality and burden of disease from 2002 to 2030. PLoS Med, 2006, 3(11):e442. Image Credit: Craig Chew-Moulding, Flickr.